Last year, 15 million people visited Japan, setting a new record. Millions more are expected. Many foreigners, eager to see the sights and spend cash, are tattooed. Most Japanese are not. This is where things get problematic. Japan has a long, varied history with tattoos. It’s complex, and I go into much greater detail in my book Japanese Tattoos: History*Culture*Design, but some of that history is connected to punitive tattoos, meted out to brand and punish people for indiscretions. Other parts show how the working class embraced tattoos as a way to express themselves as well as protect their bodies. And yes, there is a tradition of gangsters getting them, too, but do not think only yakuza get tattoos in Japan. That is simply not true. People who are into tattoos get tattoos, and they come from all walks of life. There is also a tremendous variety in the types of tattoos Japanese people get, from more traditional pieces to avant garde and even geeky ones. Most Japanese are not tattooed and even today, tattoos continue to be stigmatized in the mainstream. There are several reasons for this. One is the previously mentioned associations with organized crime. Another, however, is less obvious and is rooted in the Japanese subconscious. Today, Japan is not a Confucian society, but Chinese culture has been extremely influential, especially from the 8th century to the 12th century. Ideas of filial piety continue to exist in modern Japan, which is why, even today, some people will say that they think getting their bodies inked is disrespectful to their parents who have bestowed said body. In Japan, tattoos are often private. Traditional bodysuit tattoos, for example, are designed to be worn under clothing and covered. The rub becomes when those private tattoos enter a public space, such as a hot spring or bathhouse. You’re naked. Everyone else is naked. Hiding extensive work is difficult, if not impossible. According to The Economist, the Japan Tourism Agency (JTA), a government agency, polled hot spring resorts and hotels around the country and found that more than half banned tattooed guests. But that same poll stated that a third of foreign visitors said Japan’s hot springs, or “onsen” (温泉) in Japanese, were one of the main reasons they visited the country. In the past, when far fewer foreign tourists visited Japan, it was easier for these businesses to turn away inked locals. Not that it made such discrimination a-okay, but that’s how it’s been. Until now. Millions of foreigners are pouring into the country ready to see the sights and spend money. Today, rejecting tattooed tourists can be potentially embarrassing internationally, like in 2013, when a New Zealand scholar with traditional Maori tattoos was turned away from a hot springs. All of this is probably why, The Japan Times reports, that the JTA asked hot springs owners to permit tattooed-foreigners earlier this month (full disclosure: I’m a columnist at The Japan Times). The association isn’t asking for similar exceptions for tattooed Japanese. Japanese families visit hot springs and with the country’s pervasive skittish attitude about tattoos, the problem becomes whether the non-tattooed Japanese residents are understanding enough to patron hot springs that allow tattooed guests, even if they are foreign. The agency’s request runs the risk of alienating those Japanese hot springs visitors who don’t want to see tattooed people while bathing. But this is about learning about other cultures, says the agency. Akamichi [a Japan Tourism Agency official] said the current no-tattoo policy at many onsen resorts had indiscriminately rejected people with tattoos, including foreign guests who wear them for fashion, religious or other reasons. The vexing thing about this comment is that many of the Japanese people with tattoos also got them for fashion or religious reasons! It’s even more frustrating because this attitude neglects that foreign gangsters also have their own tattoo tradition, so in the Japanese government’s eyes, would that be okay? Then, there are just intellectual inconsistencies. For example, there are many Japanese tattoo motifs with Chinese origins, so the agency is saying that a Chinese tourists could be similarly inked with those designs, but a Japanese patron could not? There is historical precedent for special treatment of tattooed foreigners dating back to the late 19th century. 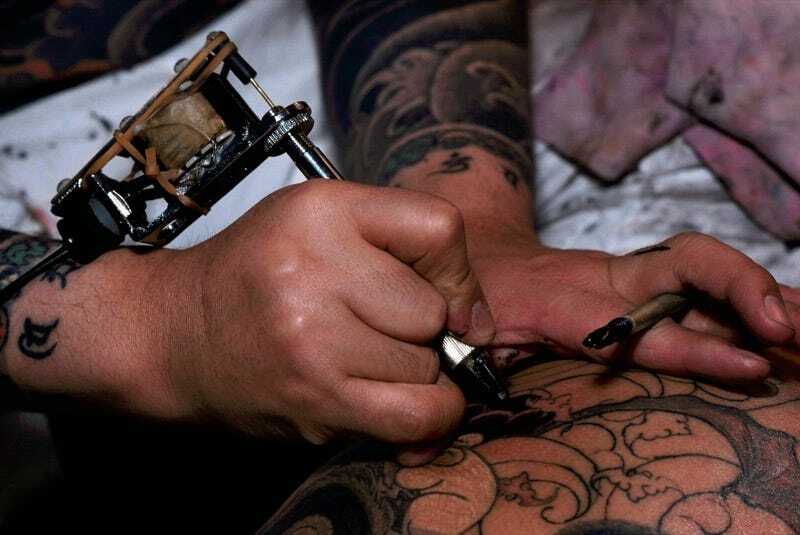 When it became illegal for Japanese to get tattoos, that law didn’t apply to foreigners. In Japanese, 中途半端 (chuuto hanpa) means “half-finished” or “half-assed.” This whole plan is very chuuto hanpa. The baffling thing about this whole push is that while the JTA is trying to get hot springs owners to relax rules about tattooed guests, there’s currently a court case going on in Osaka to determine whether or not tattooing, one of the country’s most influential art forms, is even legal in Japan. That’s the problem. All sorts of mixed signals are being sent out. The tourist agency wants to be respectful toward inked foreign visitors, while local Japanese authorities are trying to destroy tattooing. The contradictions are astounding.